Have you ever imagined that you can enjoy those 3D movies at home except in the movie theater? For me, watching 3D movies in the theater is quite uncomfortable and kind of depressed. I think it bring the same feeling to you. Why not try to watch a 3D movie at home? If you’ve got Blu-ray sources and of course a 3D TV, it is not difficult to satisfy yourself with a powerful 3D visual impact. Then how to make your Blu-ray sources playable on your 3D TV? As is known to all, SBS 3D MP4 videos can be best played on 3D TV. The only problem here left unsolved is how to rip your Blu-ray to MP4 side-by-side 3D video. As an experienced user of various rippers, you can leave your trouble to Pavtube BDMagic (now is 30% off) – a magician in ripping and converting field. With the best 3D Blu-ray Ripper at hand, you can easily convert 2D Blu-ray/DVD sources to 3D videos in MKV/MP4/MOV/WMV/AVI formats with side-by-side, top-bottom, or anaglyph 3D effect. Apart from these 3D video formats, common/HD video formats or video formats suitable for those popular devices are also available. Here I will make a guide for you to rip Blu-ray sources 3D MP4 videos with side-by-side effect. Run Pavtube BDMagic, and click “File” ＞ “Load from disc” load your blu-ray movie to Pavtube BDMagic. Here an external or internal Blu-ray drive is essential to read your blu-ray movie. In addition to blu-ray discs, you are also allowed to load Blu-ray folder/ISO Image File stored on your computer’s hard disk drive. 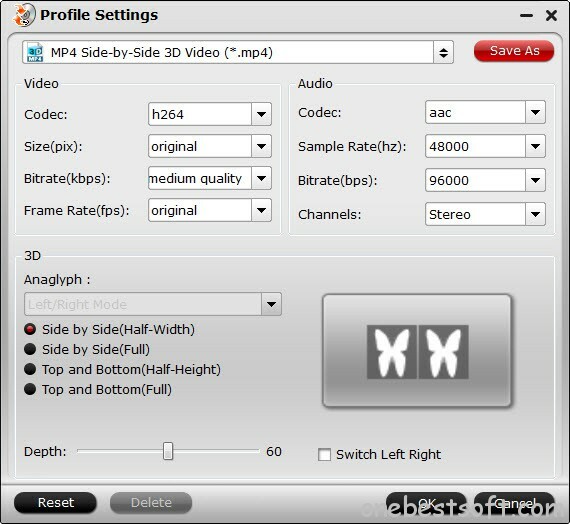 After loading your Blu-ray disc to the best 3D Blu-ray Ripper, click the “Format” bar to find 3D video, and choose “MP4 Side-by-Side 3D Video (*.mp4)” as your target output video format. Tip: Customize 3D video effect by entering “Settings” tab to achieve the best video effect on 3D devices. After setting everything down for Blu-ray source conversion to 3D MP4 videos with SBS effect, click the big red button “Convert” on the bottom right side of the main interface. You can use Pavtube BDMagic to rip all your 2D/3D Blu-ray/DVD sources to 3D video formats for watching your favorite videos on 3D TV. So there is no need for you to pay the movie ticket or sit with the big crowd in the theater every time you want to watch a 3D movie. Pavtube BDMagic is possible to bring everything you want from the 3D effect. If you are also a fan of DVD burning, Pavtube DVD Creator will realize your dream. And as a bundled series, Pavtube BDMagic and DVD Creator only cost you $49.9. For more sales promotion, please visit www.multipelife.com/special-offer. Wow, this paragraph iss pleasant, my younger sister is analyzing such things, so I am going to let know her. Thanks for sharing the 3d converter, I like it.